In this article, I will tell you about lecturers' jobs which have been announced in Cadet College Sargodha. Apart from the lecturer in The Cadet College Sargodha, more varied jobs have been announced. If you have a tutorial experience then you can apply for this job properly. If you are from Sargodha and are looking for a job then you must apply in these jobs. Men and women both are eligible to apply for jobs in Cadet College Sargodha. We provide you all the job information of Pakistan first, if you like our article, then express your opinion so that we can improve our website. 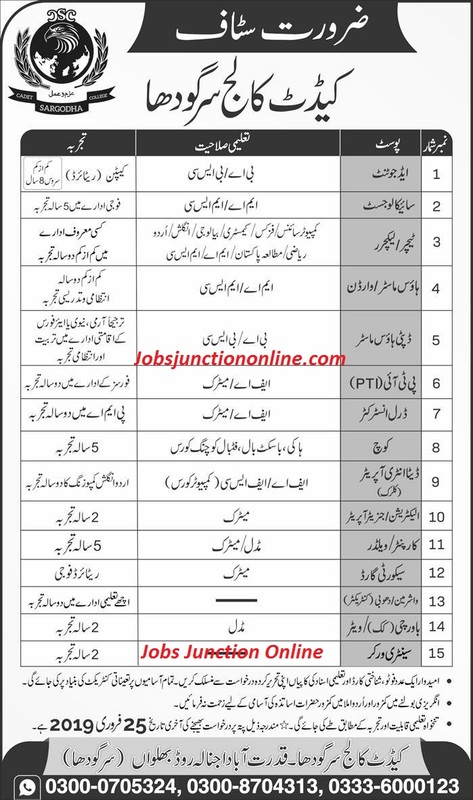 Your education should be MS.c in a relevant subject or MA, BA, BSc, FA, Matric also apply for Cadet College Sargodha job 2019. How to apply for Cadet College Sargodha job 2019? People who want to apply for this job and Interested Candidates send their applications along with copies of Academic Certificates, CNIC, Domicile, and fresh passport size photograph to the office of undersigned. Qudratabad, Ajnala Road, Bhalwal Road, Sargodha.